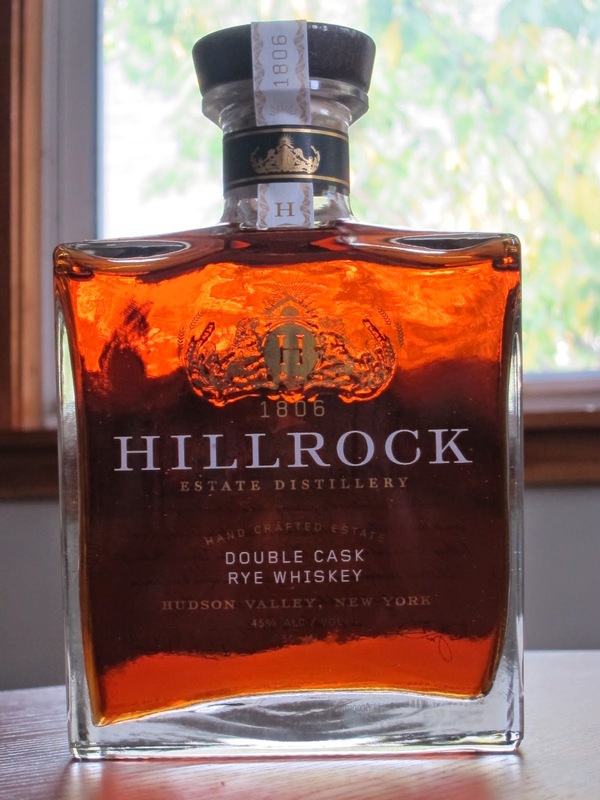 Hillrock Double Cask Rye Whiskey (45.0%): Last weekend when we were driving back home from Woodstock we stopped by at Hillrock Distillery. The Distillery is situated in Ancram, NY, in the Hudson Valley highlands on an unbelievably beautiful estate. The owner Jeffrey Baker and his team are on a mission to produce as much as possible on site. They plant and harvest their own rye and barley (corn is sourced from local farmers) and malt their barley on their own malting floor which is the first one I have ever seen in US. They smoke their barley in their own kiln with peat imported from Scotland, distill the spirit with a gorgeous looking Kentucky made still and age and bottle their whiskey on the very same compound. Under the lead of Master Distiller David Pickerell who used to work with Makers Mark they already have a Solera aged bourbon, two rye whiskeys and a peated single malt under their portfolio. Luckily after the tour we had the chance to sample all of their line-up and ended up coming back home with this Double Cask Rye Whiskey bottle. Thank you to distillery worker Tyler who gave us a fantastic tour. The whiskey is first filled in small size casks and then transferred to bigger and heavily charred casks already seasoned for two years before they are assembled. The number of the barrel our bottle is filled from is 21. By the way that bottle looked a little over-designed to me but it's a matter of taste I guess. Color: Chestnut honey, deep dark amber color with a red hue. Nose: Old leather couch, sweet balsamic vinegar and pomegranate molasses. Newly polished hardwood furniture and sweet muscat wine. Palate: Cooked zante currants, nutmeg, cloves, ground allspice. Grape juice, young armagnac and the disintegrating collars of your very old vintage bomber jacket. Finish: Long with chipotle peppers, golden raisins and more cloves. Overall: I am very impressed with it... It is a very solid whiskey despite its young age. I have to admit that I do have a little bit problem with its price tag though. This whisky priced just under $100 is a little too much for a spirit that young. I can totally understand the desire to get some fast cash flow running after visiting the distillery and seeing how much money they spent for this superb site but still it is very hard to justify the steep price. To be honest it is the sole reason why we came back home with one bottle only. Actually we liked their bourbon and single malt as well but couldn't spend that much money and had to choose one... But definitely keep an eye on Hillrock. Their line-up is great and will be even better in time with their whisky aging longer and longer in the warehouse. I got even more excited to see all the sherry butts on site waiting to be filled.